Although I have posted a similar dish before, I made a slight variation from my usual recipe when I recently thawed a block of frozen yellow fin tuna. (As I mentioned this frozen tuna is my emergency tuna supply which I keep in the freezer). 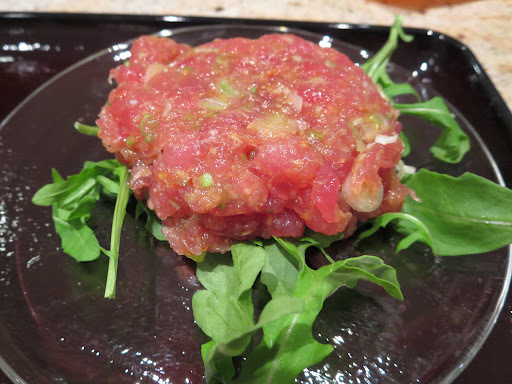 The quality of the tuna is not good and requires some effort to make palatable. Here I made “nuta” salad with “yubiki” tuna, blanched greens of scallion, wakame seaweed, cucumber and nagaimo with vinegar miso dressing. One of the reasons I made this dish was that we had a similar dish (made with better quality tuna) at Kappa in San Francisco. Block of yellow fin tuna: I used about 1/3 of the block. After thawing, I put the block in boiling water with a dash of sake for 10-15 seconds until the surface turned white all over. I then put it in ice water. After 30 seconds, I fished the tuna block out of the water and patted it dry with a paper towel. I cut the tuna into bite size cubes. Scallion: I only used the green part of the scallion (4-5 stalks), I cut them into 1 inch segments and blanched them for 1 minute, then soaked them in ice water and drained. Wakame seaweed: I used salted and frozen wakame (not dry one). I washed it to remove the salt and soaked it in cold water for 10-15 minutes to hydrate. I cut it into short segments. Cucumber and Nagaimo: Both were cut into small dices (skin peeled from nagaimo). Dressing: This is my usual karashi sumiso dressing. 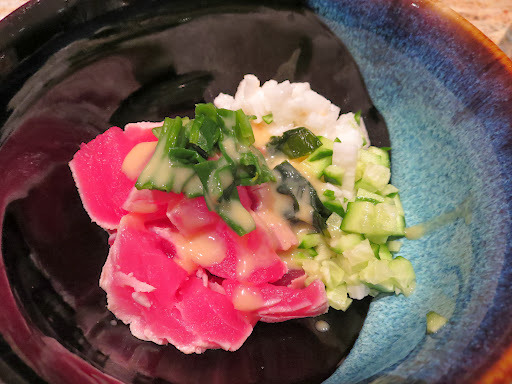 This low- quality frozen yellow fin tuna tasted quite decent in this dish. I also made “Namerou” of tuna with garlic, ginger, scallion and miso (above) which was quite palatable with sips of cold sake. I also made “Yamakake” using the remaining block of tuna. I marinated the small cubes of tuna in a mixture of sake and soy sauce in the refrigerator for a few hours prior to serving. With these three dishes, we finished the entire block of yellow fin tuna.